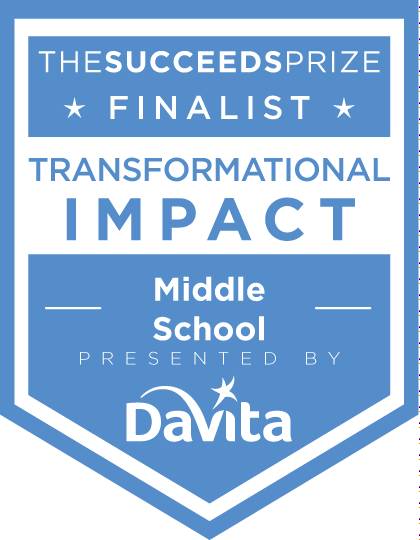 Victory Preparatory Academy is currently a finalist for The Succeeds Prize Transformational Impact in a Middle School Award. The Succeeds Prize, a collaboration between 9NEWS and Colorado Succeeds, is the state’s most prestigious awards and recognition event for Colorado’s public schools and educators. Victory Preparatory Academy is a finalist along with two other top notch schools that are making a meaningful difference for students. Victory Preparatory Academy serves middle and high school students in Commerce City and is an expansion of a successful elementary program, Community Leadership Academy. The now K-12 schools serve over 900 students, 86 percent who qualify for free or reduced lunch, 93% who identify as Hispanic or Latino, and over 55% who are English Language learners—percentages higher than those of the geographic district. Victory Preparatory Academy offers a no-excuses environment, delivering a liberal arts education with an emphasis on STEM as well as Business and Entrepreneurship where students attain the skills they need to be successful learners. Both the middle and high school levels of Victory Preparatory Academy earned a Center of Excellence Award for having high rates of student longitudinal growth while serving a large at-risk population. The middle school received the ELPA Excellence Award for achieving the highest English language and academic growth among English learners and the highest academic achievement for English learners who transition out of the English language proficiency program. Notably, Victory Preparatory Academy was 1 of 10 schools in the state to receive this award. Additionally, both the middle and high school levels of Victory Preparatory Academy received the John Irwin Award for demonstrating excellent academic achievement based on three-years of school performance on the state performance framework. Victory Preparatory Academy is designed as an architectural and programmatic bridge environment. This secondary educational atmosphere builds upon the solid learning fundamentals established in the elementary school, Community Leadership Academy, and helps students along the path to specific occupational goals. The school’s vision is to provide students the opportunity to develop intellectual curiosity and a sense of confidence based on competence, as well as to discover themselves, their relationship to others and to the world in order to become successful leaders in careers and the global community. VPA is committed to provide high quality liberal arts education with an emphasis on S.T.E.M., specifically related to engineering and entrepreneurship. VPA provides its program within a nurturing environment where every student is respected for individual dignity and encouraged to pursue personal growth as a vital member of society and as a scholar. Students in the Commerce City community face almost insurmountable obstacles in accessing what many young people take for granted. Because success is a learned and practiced set of skills, Victory Prep is specifically designed to help students learn the tools to transform the probability of failure into a strong opportunity for success. 90% of our students qualify for free/reduced priced meals, 75% are English Language Learners, and 90% are Hispanic. We strive to create an environment where students aspire to be educators, engineers, politicians, business men and women, and – most importantly – exemplars for improving our world.